As you've surely heard if you care about such things, the Knicks aren't going to have a ton of money to spend this summer. They're waiting on the outcome of a union arbitration case that will determine exactly how stingy they'll have to be to assemble a full roster. After resigning Jeremy Lin and whoever else they'd like to keep, New York could have as much as their mid-level and biannual exceptions and as little as the bare minimum to spend, depending on how the arbitration shakes out. In either event, the Knicks aren't likely to be competing for the big-name, big-ticket free agents this off-season and will have to make the most out of some minimum contracts if the roster is going to improve at all. Doing that will require some creativity and, in an encouraging sign, the Knicks have already demonstrated an open-minded, wide-ranging approach to the off-season. 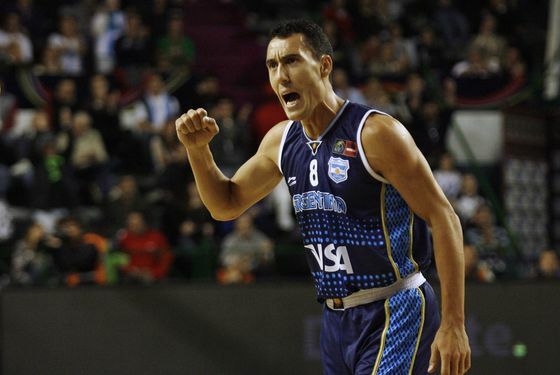 The news today is that the Knicks spent a few days last week meeting with Pablo Prigioni, a 35-year-old Argentinean point guard who's enjoyed a long, successful career in the Spanish league. According to the Post, Glen Grunwald and Mike Woodson took Prigioni out to dinner and around Madison Square Garden, a fine welcome for their visitor from abroad. The hope is to woo Prigioni into turning down a one-year deal with his incumbent club, Caja Laboral, in favor of one of those $1.4 million veteran's minimum deals or perhaps the slightly greater biannual exception. It's hard to think of a player who ditched a foreign league for the NBA this late in his career (Prigioni's been playing pro ball since 1995), but if he's interested, the Knicks could definitely benefit from Prigioni's shooting, passing, and general veteran savvy (albeit honed in a different setting) as Lin's likely backup. He's not the cream of the importable crop, but, again, we're talking about a likely minimum contract. Prigioni's not the only foreigner drawing interest from the Knicks, either. Though he's expected to go elsewhere, Bosnian star Mirza Teletovic reportedly received some inquiries from the Knicks, and there were rumors over the weekend of a meeting with Tunisian big man Salah Mejri. There will be headlines linking the Knicks with guys like Steve Nash, Lamar Odom, and Jason Kidd all summer, and they do have a second-round draft pick next week, but in all likelihood, there will be one or two Knicks of unfamiliar and perhaps exotic origins by the the time training camp opens. At the very least, they're doing their due diligence and checking on most available foreigners. It's kind of exciting, no? No? Okay.